automatic request-repeat radioteleprinter system ... developed for the commercial maritime service ..." (and commonly known by the trade name "Sitor" in that service). 2. The League's petition states that AMTOR has the inherent benefit of " - - - reliable, error-free copy at the receiving teleprinter, and the certainty of the sending operator that the data has been received correctly." A station utilizing the AMTOR code 11 ... transmits data in blocks of three characters, pausing after each to obtain from the receiving station either an acknowledgement or instructions to re-send." According to the League, "The automatic 'handshaking' technique of AMTOR transmissions allows reliable communication even under marginal and fading high frequency propagation conditions." The two digital codes currently authorized for use in the high-frequency bands, Baudot and ASCII, 2/ do not support this feature. 3. In a recent action in the Commission's	proceeding dealing with the use of additional digital codes in the	Amateur Radio Service, the use of any code was authorized in all amateur frequency bands above 50 MHz. 3/ However, in the Notice	of Proposed Rule Making in that proceeding 4/, the Commission	did not propose to make such a blanket authorization for	the frequencies below 50 MHz in consideration of our	international obligations. 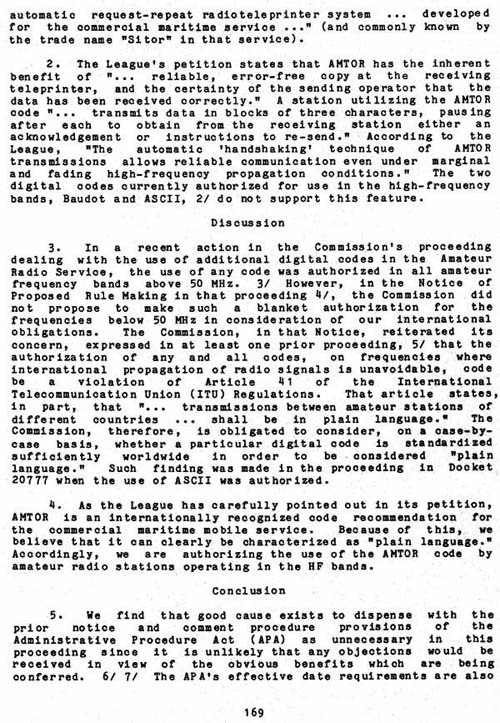 The Commission, in that Notice, reiterated	its concern, expressed in at least one prior proceeding,	5/ that the authorization of any and all codes, on frequencies	where international propagation of radio signals is unavoidable,	code be a violation of Article 41 of the International Telecommunication Union (ITU) Regulations. That article	states, in part,	that "... transmissions between amateur stations	of different countries ... shall be in plain language." The Commission, therefore, is obligated to consider, on a case-by-case basis, whether a particular digital code is	standardized sufficiently worldwide in order to be considered "plain language." Such finding was made in the proceeding in	Docket 20777 when the use of ASCII was authorized. 4. As the League has carefully pointed out in its petition, AMTOR is an internationally recognized code recommendation for the commercial maritime mobile service. Because of this, we believe that it can clearly be characterized as "plain language." Accordingly, we are authorizing the use of the AMTOR code by amateur radio stations operating in the HF bands.